Daryon Simmons, better known around Chicago as "DLOW" for his music, dancing and choreography was featured in the Friday, January 15 2016 edition of The Wall Street Journal for his movement of moves thats started on the west side. The article highlights DLOW's massive social media numbers and his Chicago 'bop' or 'boppin' dance style that has exploded since 2013. The music and dance style has found in the music of other Chicago artists like King Louie, Lil Durk, Sicko Mobb and more. Most notably, DLOW has acquired over 45 Million streams on YouTube with 148,000+ subscribers. Other social channels like Instagram (144,000+) and Facebook (30,000+) help solidify the Bellwood native as a influencer in the global dance community. DLOW's most popular video is titled "Bet You Can't Do It Like Me Challenge", released in late September 2015 has amassed over 37 Million+ views. The video's music production comes from fellow Chicagoan and producer Nun Major Beats. In November of 2015, Simmons tweeted that he had signed to record label Capitol Records. DLOW was signed by music industry veteran and German music executive Alexander Wilhelm, the Senior Director of A&R who also notably signed fellow 'dance' based artist Silento, who is behind the international massive viral hit "Watch Me (Whip/ Nae Nae). Wilhelm has also previously worked with artists like Jason Derluo, Nicki Minaj, Katty Perry, LMFAO, Drake, The Weeknd, Neon Trees and more. Wilhelm's track records with dance-based music is a clear great sign for DLOW. 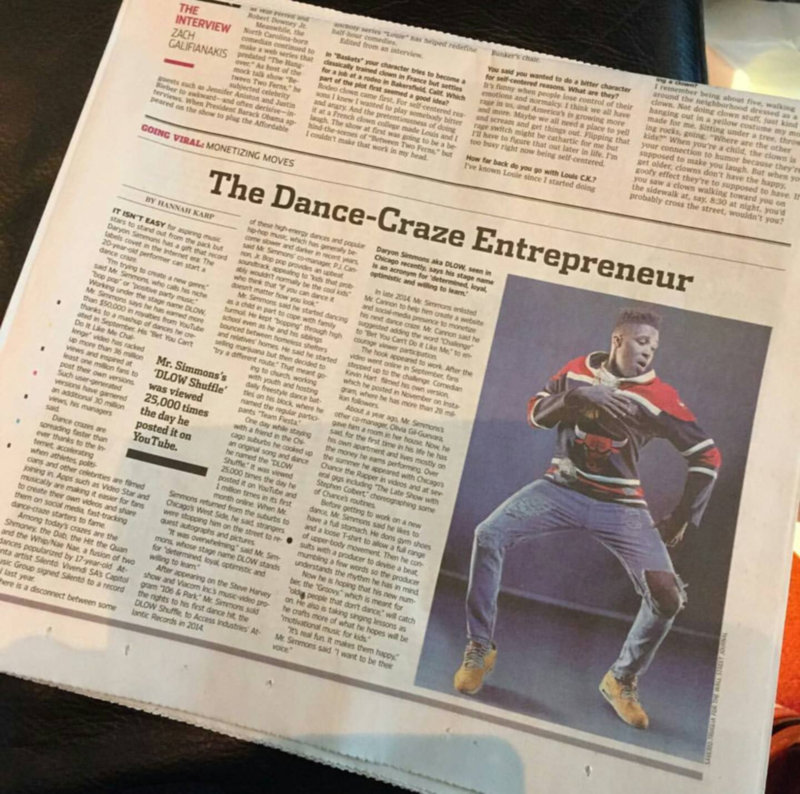 The Wall Street Journal also put together a YouTube video featuring DLOW's 'bop pop' dance style. DLOW is featured an digital version of the article that highlights dance crazes going viral on social media. Further reading can be found at WSJ.com. This article's cover image is by Chicago photographer Saverio Truglia for The Wall Street Journal.